Consider the whole Combe Yard site as it was over a hundred years ago. The Clerk of the Works would have overseen all of the workers in the yard site who worked predominately on a contractual basis. The yard was essentially the workshop for the Blenheim Estate and the workers ensured the palace, as well as houses and farms located on the estate, were well kept. As well as providing labour for, amongst other jobs, repairing fences, walls, chimneys, barns and boilers and for undertaking plastering, roof tiling, thatching and whitewashing, products like nails, nuts, bolts, bricks, guttering, wallpaper, gates, paint and lime mortar were produced or stored at the yard for use by the labourers or for purchase. Throughout the mill evidence of who once worked there can be found: an engine driver; a blacksmith or two; some pattern makers. However, there were many more jobs on the site, the evidence of which has been lost over time. The Clerk would also have overseen sawyers working in the main sawmill, now a business unit. He would have been able to look out over the yard where he could have witnessed trains bringing in coal to the private siding, the stable hand tending to the horses used for deliveries, the brick maker bringing a delivery of his bricks from the brick yard, which was just up the road, the carpenter working with the freshly sawn wood and slaters and plasterers preparing to leave for a day’s work on the estate. 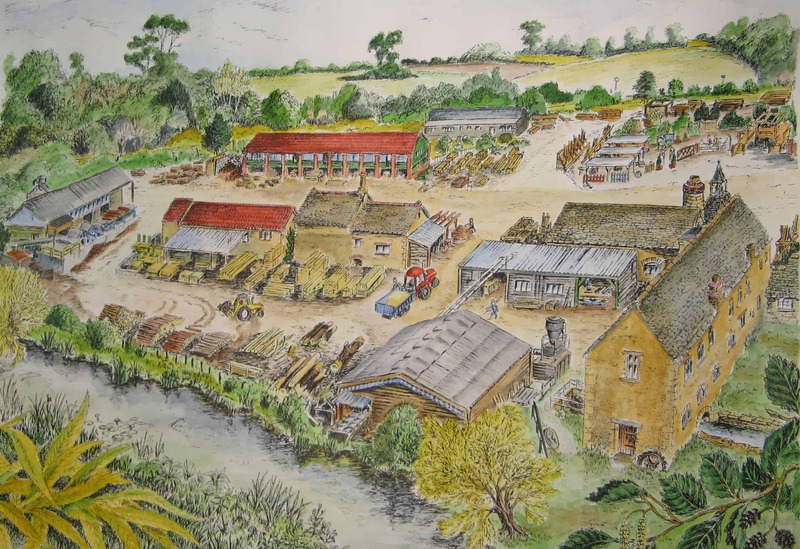 An artist’s impression of Combe Yard as it was in the year 2000. It was still a working yard at this time and the sheds would have been full of timber. The roofs of some of the buildings were tiled with red Bridgwater tiles which would have given a pleasing aesthetic to this industrial site.